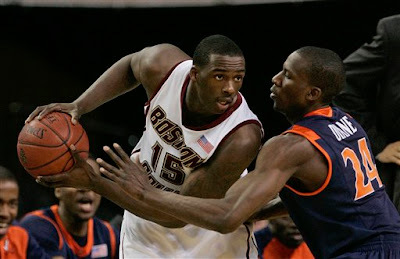 Rakim Sanders scored 25 points and Boston College closed the first round of the Atlantic Coast Conference tournament with a sluggish 76-63 win over Virginia on Thursday night. The Eagles (22-10) built a 37-25 lead by halftime and coasted the rest of the way against the ACC's lowest-scoring team. Virginia finished the season 10-18, its worst since a 9-17 record in 1966-67. Mamadi Diane led the Cavaliers with 24 points, hitting 4 of 6 from beyond the 3-point arc, but he had little offensive help. Virginia shot just 37.5 percent (21 of 56) from the field and turned it over 20 times. Boston College advanced to face No. 9 Duke in the quarterfinals Friday night.